I have posted before about a few things that are unhelpful to say to someone who is experiencing depression (here and here) and I thought I would draw together the ten least helpful things in one post. Similar lists can be found all over the internet, of course! This, and similar comments, assume that someone who is depressed can easily stop themselves feeling depressed, and recover. It paints what is a serious mental illness as some sort of character flaw or moral laziness, something which is very easy to stop if we only want to enough. The reality is not so simple – depression is a real condition which I have never been able to argue myself out of or “pull myself up by the bootstraps” – I experience depression as a debilitating illness which saps all my strength, all my energy, all my will in a spiral of bad feelings and thoughts, which stops me enjoying anything about my life. I can only wish it were as simple to be cured as this comment suggests – the reality is that it is not. Similar to the above, this suggests that we can “think ourselves happy.” I have tried to find my happy thoughts when I am depressed but frankly, when your brain is telling you life is a misery and you just want to end it – it is hard to find those happy thoughts. What thoughts I can dredge up seem hollow and empty and I simply do not believe in them. According to Beliefnet when depressed people try to think positively we only activate the fear centres in our brain, rather than making ourselves feel better. 3) You need to do something for others/work it off. This is hard particularly because, as a Christian, I really should be giving back to other people. Yet when I am ill I feel completely unable to do anything, I cannot concentrate, I cannot hold a conversation, I feel useless and worthless. Telling me I should do more or work it off makes me feel guilty as well as depressed, it tells me that you think I am lazy and self absorbed, when in fact I am simply suffering from an illness – and I would not expect you to work/volunteer when you are unwell with something serious, neither should you be prescribing work as the solution to my problems when I am not fit to do so. 4) Think of other people worse off than yourself. I covered this in my article Count Your Blessings – while I think it is important that we are grateful for our lives and for the good in our lives, and we are to give thanks to God in all circumstances – contemplating the suffering of others does not, in fact, make me feel better. It makes me feel considerably worse. You see, my brain twists that into “those people are starving, and I am depressed. If I were dead there would be more food for those people.” It also says “how can I be depressed when these people are homeless/suffering/etc – I am just a worthless excuse for a human being. I need to punish/kill myself for being so selfish.” I think that people who say this do not really realise what depression can do to the mind. 5) You need to exercise/eat the right things. I do believe that eating right and exercising can be generally helpful for people who are depressed however having someone prescribe these things when you feel so awful can seem like an added burden on a system already over-burdened. I am finding it difficult to get out of bed, to wash, to eat – where am I supposed to get the energy and the will to get myself to the gym? And I do not need you telling me I am some sort of co-conspirator in my own affliction because I am unable to exercise, or cannot bring up the ability to shop and cook decent food. I am struggling to survive here, and you are making things too simple. 6) If you take this supplement/herb everything will be OK. While alternative/complementary medicine has a place, many/most people with depression will be on psychiatric medication. Taking other medications, such as St John’s Wort, can be harmful if you are already on anti-depressants. Furthermore, like any medication, “natural” remedies may or may not work, or may take a considerable time to work, suggesting that if someone just takes vitamin B, or takes a herbal medicine, they will be instantly cured is irresponsible. 7) I had depression, it wasn’t so bad. Many people have suffered depression, and depression comes in degrees. 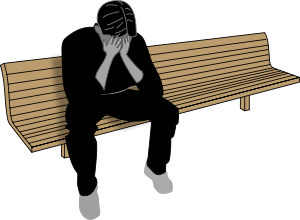 However, many people mistakenly think they are depressed when they simply have a short-term low mood – there is a difference between clinical depression and feeling a bit sad. Major depression can be soul-destroying and hearing someone say that their “depression” was nothing invalidates our experiences and makes us feel worse. Unless you too have struggled with desires to kill yourself because you felt so bad, perhaps you shouldn’t dispense advice to the depressed. I have had some people suggest that the cure for my depression would be a new job, get a boyfriend, even have a baby. A period of depression is not the time to make major life decisions – this is a time when the mind is altered, when we can be irrational, and it is really not the best time to decide to change your life. Sometimes, our illness forces change upon us – for example I had one job where I became ill, told my employer I had bipolar and got fired for it. That was a change – but that change heightened the illness and a week later I went into hospital. I think if I had not had that big change in my life I might have been able to avoid hospitalisation. 9) You don’t want to get better. Of course, it is just so much fun to be depressed that we don’t want to get better at all(!) This one often comes up if I have been off sick from work – I think a lot of people assume I am lazy and workshy rather than the truth, which is that I find it terrible, absolutely terrible working when I am ill, and I have generally gone “on the sick” from work when I start having urges to hurt myself with tools at hand (e.g. by smashing my hand into a computer monitor, or “falling” down the stairs). I want, more than anything, to have a life like that of a normal person, not this weird half-life where I am always on the watch for depression and have an unpleasantly chequered work history which is steadily making me unemployable. Being depressed is disgusting, I cannot express in words how awful it is, and how desperately I have wished it to end – and I have known that feeling, when the pain in my head is so intense that the only thing I can think of to end it is to end my own life. Do you think I don’t want to get better now? 10) You don’t look depressed. Many people, myself included, can fool people by putting on a fake smile even when we are feeling depressed. For me, it is part of my lack of confidence, I do not want to trouble people by showing them I am ill, and if I look depressed then I stand out, which I never want to do. This is known as “smiling depression” and can be dangerous, as it can mean that someone suffers, and maybe kills themselves, and no one knows. You cannot tell if someone is depressed by the look on their face – you can only know by talking to them and witnessing the pain in their heads. We should not be superficial, but consider the deeper person. Depression can be a very serious disease, leading to pain and thoughts of suicide and self harm. We should not minimise it, say negative things about those who suffer. I would like to urge those who have friends/family who are depressed to treat them with compassion – and I will be making a follow-on post to this, on things that are helpful to say to depressed people as an effort to help. What a great article!!! It’s so informative. I’m a believer whole heartedly in the Lord and his word, but I have struggled with depression, body image issues and self harm for most of my life. Most of my problem is feeling the need to be perfect in many areas. And, I know that perfect perfection, at least in the here and now, is not attainable. So, I try to get as close as possible. It is soooo draining on body, mind and soul. Since I am a Christian, I find it so confusing as to why the struggle. However, I know that “whom Jesus sets free is free indeed.” so, I keep praying and holding out for the freedom which I know someday will come. Are you a counselor, psychologist or just an experienced person on the subject? Thanks again for putting some helpful info out there for Christians who struggle with depression and their friends and families who are also affected by their depression. Thanks for the comment, I’m glad you liked the article. I’m not a medical person, just someone who has suffered from depression as part of bipolar disorder. I’m trying to figure out how my illness and my faith work together. At least to my own satisfaction if not other people’s! My parents accused me of having a “victim mentality” when i was trying to discuss my depression with them. This comment absolutely destroyed me, and i am destroyed thinking about how my own parents could have the nerve to lack the understanding of the cross their own child bears. I’m really sorry to hear that. People can be thoughtless when it comes to mental health, and think that they understand depression when they are actually thinking of normal, lighter low periods. It is deeply unhelpful that people describe simply feeling a bit down, a bit sad, as “depressed” – it means that when we suffer with clinical depression people can misunderstand how serious and how painful it really is. It may be that your parents just don’t appreciate how severe depression can be – but I am not sure what to suggest to help. Perhaps write a letter? Or see if your doctor will speak with them about it? I know when I was diagnosed with bipolar my parents went out and bought books about it to educate themselves, so perhaps some books about depression might help your parents? Please forgive your parents probably they weren’t prepared and ignorant about depression in a professional manner..they love you and must have tried in their own way to solve the problem..by making light of it…you will always be their baby…so they probably spoke in that manner. Being a perfect parent is not easy..they are all human beings with situations happening in their own lives too. Thanks for putting these points, especially #3……….. I went to a psychologist who are part of the christian counseling group recommended by the head priest from the local church we go to, and in the last session he told me to do voluntary works, I told him that I’m in such no way can do any volunteer work when I do recognize that I’m not ready to do that, then he told me while looking at my eyes that I have no hope just the session end. I do not wish him any harm and I took it as the whole misunderstanding thing just to give the benefit of doubt. I wonder though how come someone who works in supposedly christian counseling and have many many years counseling others and had depression episode himself (after his ex-wive divorce him) could give me that kind of advice and that kind of saying that I have no hope just because I do not want to do volunteering works because I wasn’t ready. My mind told me that because I stop entertained him with my problems and no longer fun/interesting to listen. And to rub on those accident, he sent me letter saying if I didn’t come to see him within a period of time he will not going to accept me in his session anymore. Is there any other more polite way to fire your patient without putting them down like that? Hi JKP, thanks for commenting. I think it is very easy for people who have had some experience of depression to project what worked for them onto everyone else who suffers with it. It is easy for all of us to forget that people experience mental distress – and recovery – differently. What work(ed) for me might by no means work for you. I would encourage you to keep trying counsellors – the important thing is to be able to talk freely and honestly with them. The psychologist you describe is obviously not the one for you! Perhaps try another one in the same group? or another recommendation? Don’t be afraid to see a secular counsellor either – for one thing just because they are not doing specifically Christian counselling does not mean that they are not Christian, but also you can see if your priest knows someone who will counsel you on specifically spiritual matters at the same time as you are working through more general problems with someone else. Thanks for commenting on my post, and I’m glad you found my website. I’ll check out your blog!